Are the 39 dead in Genoa paying the price of years of collusion between Italian officials and mafia? See this. The article is instructive because it could be one of the first popular examples of a free-for-all frenzy, an international media campaign launched to undermine Italy and in particular its National Unity government (Prime Minister Giuseppe Conte) that is enjoying an enthusiastic support in its effort to re-establish in practice and in principle the idea of independence and National Sovereignty, and to free Italy from the international financial potentates emanating from Wall Street and the city of London. Many Italians blame organised crime. Planning for the Morandi Bridge, along the route connecting Italy with France, began in the early 1960s, and it opened in 1967. Although there’s no evidence of any criminal involvement in its construction, Italy’s First Republic, from 1948-1992, was infamous for the collusion between Christian Democrats and organised crime. 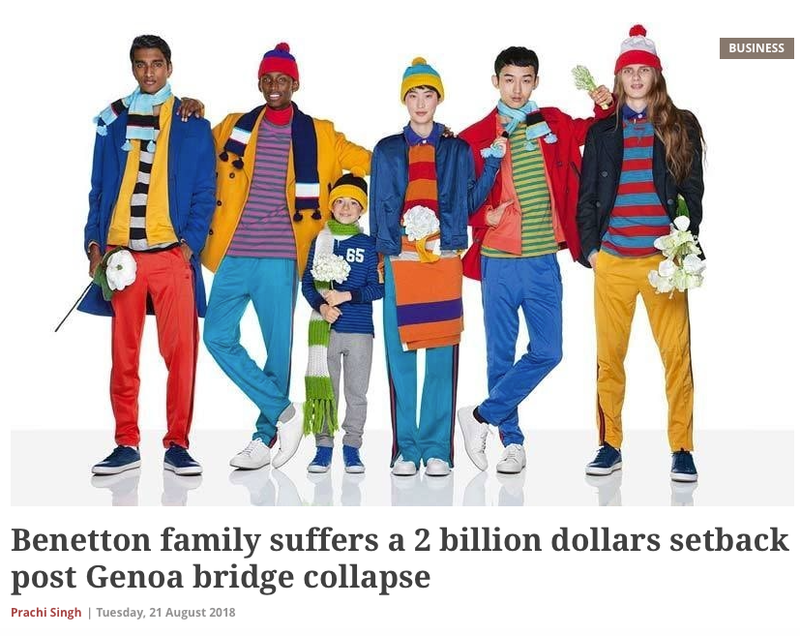 1) what both, the Italian people and the government have identified as the culprit is the Benetton Family, the financially ravenous and fashionable local oligarchs who are connected to the overlord of the city. The Benetton became rich first, buying “chip” (cheap), very chip… zero money down, and then cannibalizing the public wealth created by generations of workers and entrepreneurs. In particular the Autostrade per l’Italia, the Highways. The magic of Privatization! 2) The basic Italian infrastructures, what Italy still lives on, are the result of the first two decades of the First Republic. If one will make the effort to read the Daily Mail story, the “operation” being launched will appear quite clearly. It is likely that many other journalistic “killers” will follow in the coming days – all looking for the reward to be granted to those who will find the most effective angle to kneecap and destabilize the present government. Thr racket of the Financial “Rating”s – Finch, S&P, Moody’s, etc — will certainly follow. So, what is the “Operation”? To understand the operation, follow the money trail …. Or better, follow the media fed by “big money”. The campaign to declare Italy a “failed state” has already began. Let’s see what the Puppet-masters of the RATINGS will come out with. One has the impression that, in order to destabilize this “unacceptable” national unity government, powerful external potentates are ready to pull the plug on any possible breakable infrastructure in Italy. And there are many, many infrastructures on the verge of breaking. And yet, it is exactly these potentates that have been the ultimate looters, the top predators in the financial food chain. It is these potentates that imposed the deranged criminality known as PRIVATIZATION. 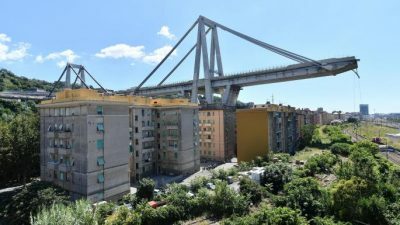 The great infrastructures that Italy acquired after WWII are the result of the work of millions of Italians who worked hard in a political and governmental framework that guaranteed a minimum of support for real economy and real labor. All the great infrastructures that Italy acquired after the destruction of the world war, all the common wealth that, not only reconstructed Italy, but lifted the country from a mostly agriculture state with few real modern communications and industrial assets into one of the biggest world industrial nations — all this was achieved by the Italians MOSTLY in the 1950s and ‘6os. This was the time of the so-called ECONOMIC MIRACLE, of a lira that was sought after everywhere – better than gold. This was the Italy of Enrico Mattei whose strategy almost uprooted the organized backwardness of the Italian South and almost deleted the word Mafia from the dictionary … before being cowardly killed by the great potentates that decided that progress & prosperity for Italy were unacceptable. The country kept going, survived,for a long time with the infrastructural wealth created in the 50s and 60s, and the economic momentum continued slower and slower, almost as by inertia, into the 70s and the 80s. But the qualitative paradigmatic jump remained that of the labor, entrepreneurs, government leaders of those first two decades. After that … le deluge! I.e. the work and the national wealth accumulated after the war was progressively sacrificed to the altar of the “P” word: PRIVATIZATION! The great potentates invested in one thing: the ideology, the brainwashing of PRIVATIZATION. Colleges (especially the departments of Economy), the media, the culture and the intellectual fashion were dominated by the idea that what millions of people had worked for had to be given away to “privates” who were controlled by these potentates. It was a scurrilous process of corruption, thievery and looting — and any leader who tried to stop it was accused of corruption, was eliminated or wasscandalized by the well-financed, well-oiled, and super-corrupted “discrediting machine” built EXACTLY FOR THIS PURPOSE. This was the real organized crime, the various mafias were the little piranhas and barracudas protected and cultivated by the top potentates of the city of London and Wall Street as a bottom feeders, as their pets, as a precious element of destabilization and social control. Now we have reached the final point in this process, the organized and accelerated looting by the financial potentates have almost devoured the flesh and bone of the country — the physical ability of Italy to survive as a modern industrial country. The enthusiastic support of the people for the present National Unity government represent a strong will of the country to fight back for its own life. And this is UNACCEPTABLE for the potentates. The looting, misery and decay must continue to the end, without obstacles. And here is for the Italians the fight to be fought to the end! One shouldn’t be surprised if the specialists in destabilization, the economic killers employed by the potentates, have conceived the idea to precipitate Italy into chaos, accelerating the destruction of infrastructures that have been weakened by the ferocious looting without investments. Maybe they see this strategy as “just give it the last push”. Do they want to provoke more “accidents”, more “plausible spontaneous destruction”? Certainly, after a local Italian gang working for the big global financial potentates— let’s say for the example the Benetton gang — has been granted the Italian highways (once the jewel of the Mattei’s vision), like a satrapy to exploit and loot to death, it is not difficult to engineer the last push and produce not one but hundred “accidents”. Is this the war the Italians have to fight in order to regain what the previous generations created, and we have allowed to be dismantled? If so, this last assault against our national sovereignty, against our lives cannot but give any Italian the determination to make these arrogant potentates pay for the past and the present crimes. The national infrastructures, the national wealth created by Italian labor and sacrifices must return to Italy, fair and square. The looters, from the bottom level of the local mafia lords, to the local oligarchs, all the way up to the financial establishment, – all this structure must be investigated, dismantled and punished! Again, the labor of Italians will be able to produce wealth for every family. Infrastructures shall be rebuilt at the most advanced technological level. This means investments in industry and state of the art agriculture. This means employment, this means income worth of prosperous and optimistic families that look with great confidence and optimism to the future of their children. Not one penny for the financial mafia, Investments for the Progress of the People. This is, by the way, is the only road to re-establish a real economy, a real process of cooperation with other European countries, as well as countries in other regions of the World: The only way to really have peace and prosperity on the world.